Government organizations across the globe are exploring the use of blockchain technology to improve operations. The ability to record transactions on distributed ledgers offers new approaches for governments to improve transparency, prevent fraud and establish trust. 9 in 10 government organizations plan to invest in blockchain for use in financial transaction management, asset management, contract management and regulatory compliance by 2018. 7 in 10 government executives predict blockchain will significantly disrupt the area of contract management. 14 percent of government organizations expect to have blockchains in production and at scale in 2017. 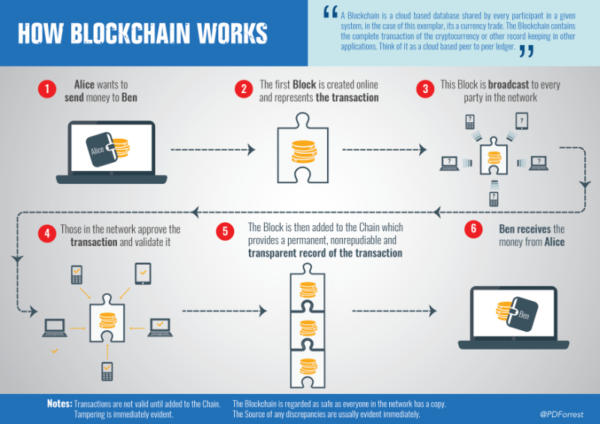 So, what are blockchains? For the technical crowd, blockchains are strings of cryptographic proofs chained together and audited in a public network by nodes. For the rest of us, it’s essentially a chain of cards put into a card catalog (like from an old-school public library) — a permanent one that is publicly audited for unauthorized changes at regular intervals. Each “block” of records within any given blockchain is tied to the previous one in a “chain,” creating links that establish permanence. With a publicly accessible ledger, there is no central authority overseeing authenticity and security. The network itself acts as the judge and jury and guards itself against internal and external attacks. So with all that being said how would this emerging technology help securing our National Identification System. A big challenge for government is its ability to efficiently track and identify transactions and individuals, particularly with limited resources. This is often exploited, costing the government billions of dollars in fraud. The transparent and networked nature of blockchain, however, makes it much harder to abuse the system. In addition, blockchain can help with unique identification of individuals, making it difficult for them to pose as someone they are not. With this if someone in the bottom of the sea tries to use your NIN data you can see what data is held or used, who has accessed it and why. All transactions/ information transmitted via the blockchain is encrypted and digitally signed so it can only be accessible by authorized parties and cannot be altered. Blockchain could also help with giving citizens better transparency into their own data. Estonia is taking electronic health records to the next level by incorporating blockchain technology in order to track records, whose accessing them, and changes to those records. This not only gives the public better transparency, but also ownership over the data and the ability to control their own healthcare. Having a decentralized system will allow for more robust and fault tolerant identification system is a major advantage to us. Putting it in layman’s terms, you maybe able to use the identification system even if a section is experiencing difficulties. Special Thanks to contributor Solomon Perkins for adding some information on this post.